You’ve been seeing a lot of sweet floral designs and cute cartoon designs here recently courtesy of Jenrine, so I thought I’d throw in something shockingly different for a change! 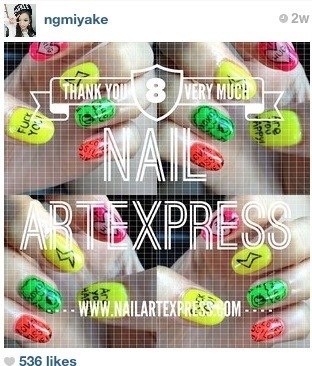 Today’s design was requested by pretty celebrity blogger Miyake, whose gel nails I have sponsored since last year! This is based on a reference picture that she showed me. Unfortunately I have no idea where it’s from, so if you do, please let me know! 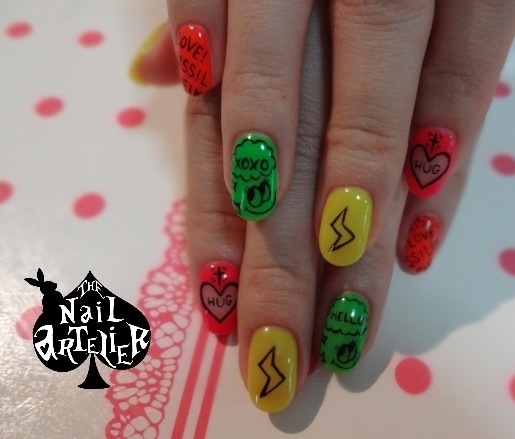 She usually opts for sweet girly designs or dark edgy ones, so she wanted something neon and loud this time round. 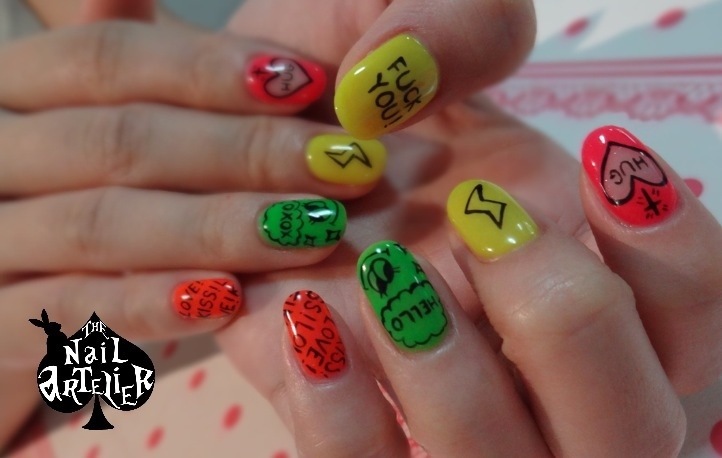 The only thing we changed was the words on one thumb, which was originally quite PG but then became somewhat rude after the change. 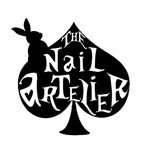 No prizes for guessing which nail we changed! Here are some screen grabs from Miyake’s Instagram (nick: ngmiyake) account! Collaboration with Helloあsia Singapore’s J Diary! 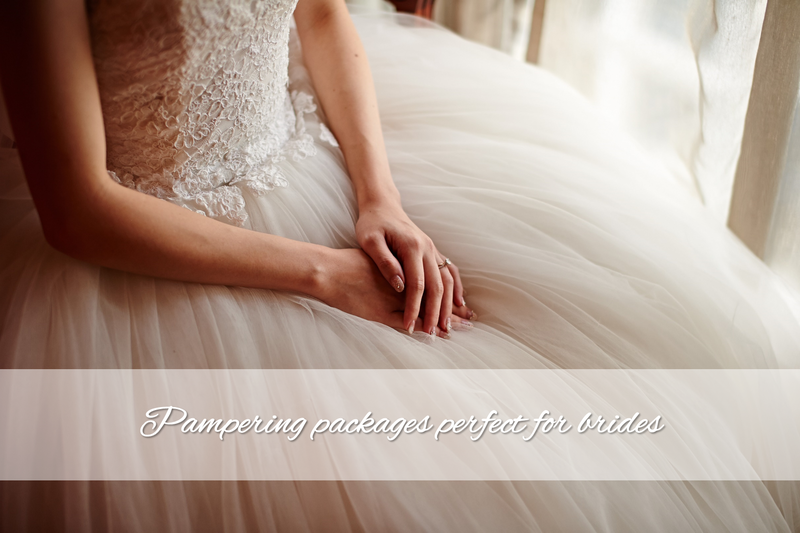 I am SO excited to be sharing this video with you finally! Here’s the back story on this video – a while back, my friend Evonne approached me to guest in an episode of J Diary, a new video channel hosted by Yukie-san of Tokyo Mode Addict and funded by Helloあsia Singapore. 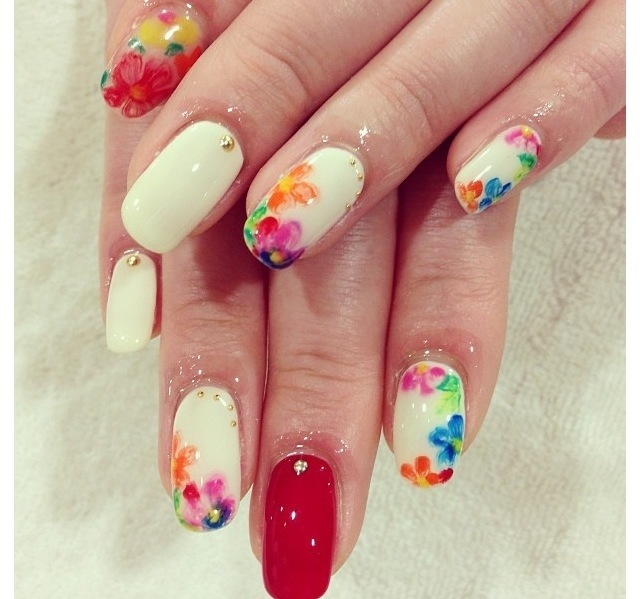 I found out that it was for the second episode, focusing on Japanese-style nail art in Singapore, and I was happy to climb on board! So, Yukie-san and Evonne both came over to my place, together with Yukie-san’s helpful and talented filming crew (all girls!). Due to time constraints, I had to complete the gel manicure (full classic process) with nail art in an hour and it was super stressful! I blogged about it two weeks ago and you can see the original post here. Vanessa’s friend is a big fan of Adventure Time too, but she loves breakfast even more, bacons and eggs in particular! 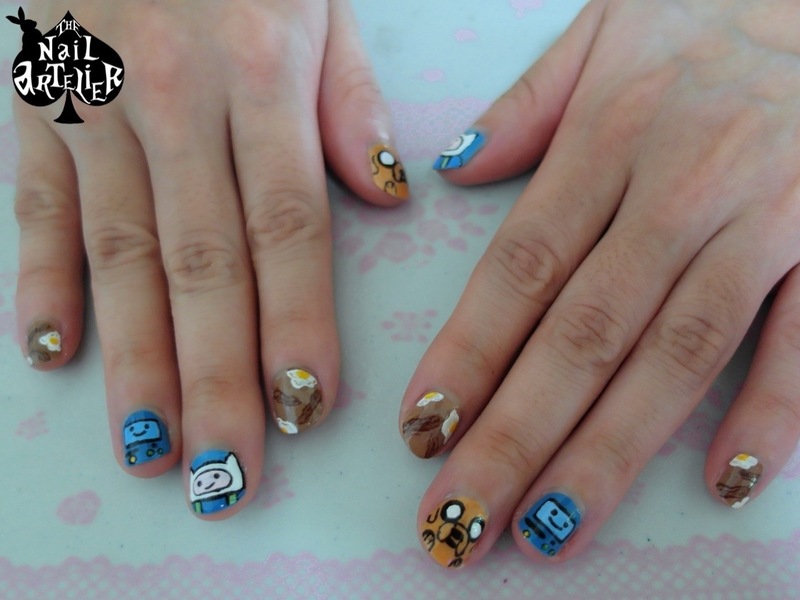 She requested for bacon and eggs as accent nails, and Jake, Finn, and BMO. Super cute, especially with the breakfast sets! 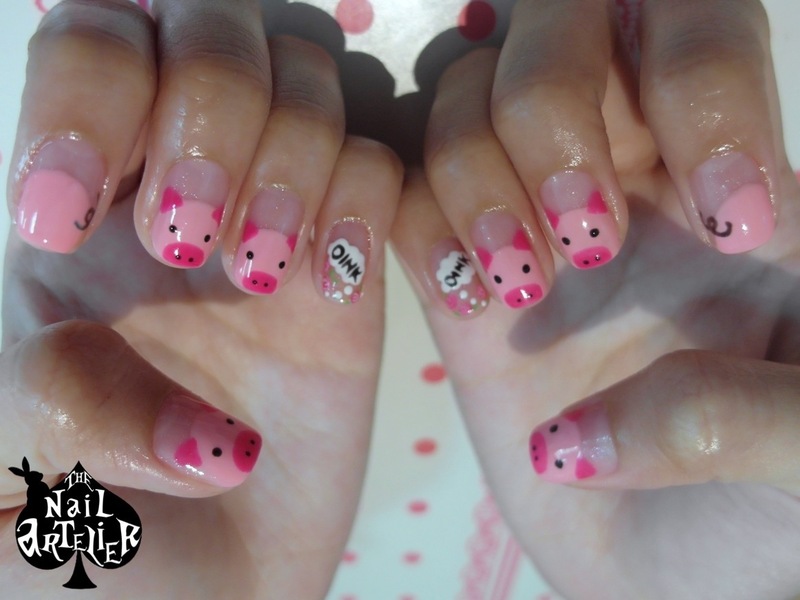 This customer loves pigs a lot, and wanted them on her nails! 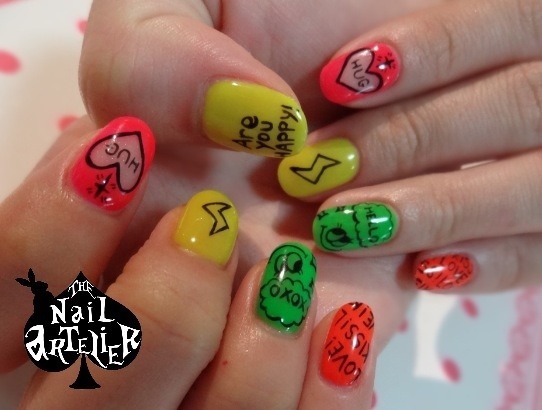 I used AngelPro #39 (light pink), #21 (Barbie pink), #29 (black), #47 (white) and #145 (green). 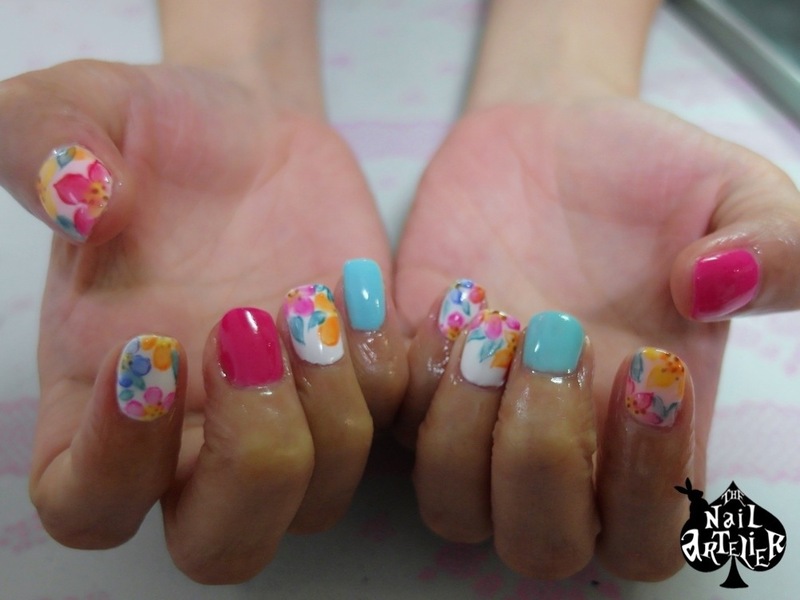 Michelle wanted a floral set of nails for her birthday, and she showed me this set of pretty watercolor flowers set. We omitted the studs, and changed the colors around. 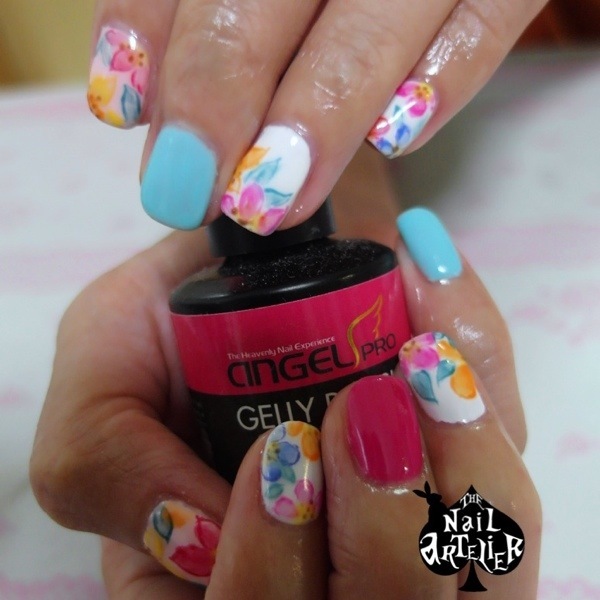 We used hot pink (AngelPro#23) and mint blue (AngelPro #11) as accent nails, and light pink (AngelPro #1) and white (AngelPro #47) as the base for the flowers. A lot of colors were used for the flowers, AngelPro#18 (orange), #146(yellow), #35(red), #143(blue), #30(brown), and #144(green). I am still experimenting with watercolor effects on gel, so….do request for them! 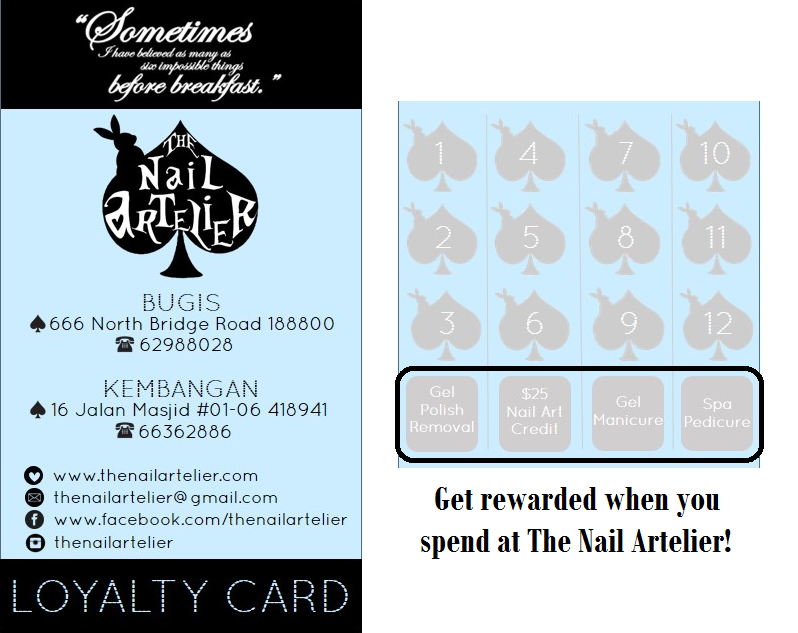 We’ve been busy preparing for The Nail Artelier’s grand opening – the last time I blogged about this, we’d just printed our name cards, and this past week, we’ve been sorting out our furniture! 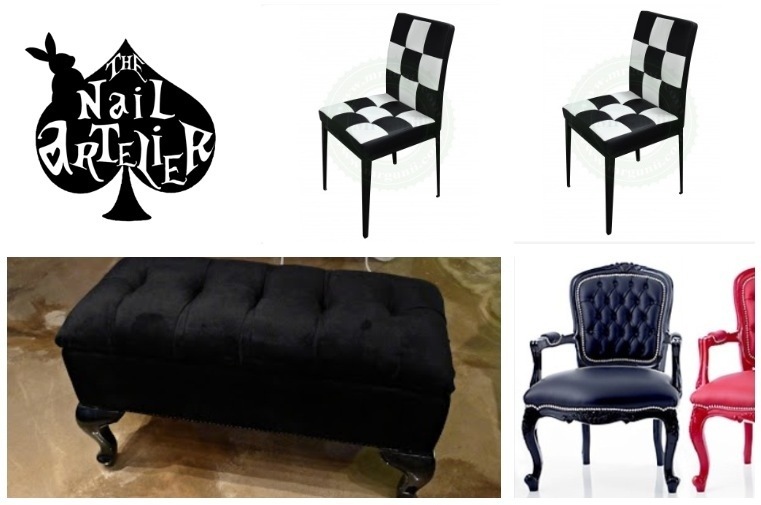 We still have a lot of pieces that we need to custom-build and to purchase… Whew! 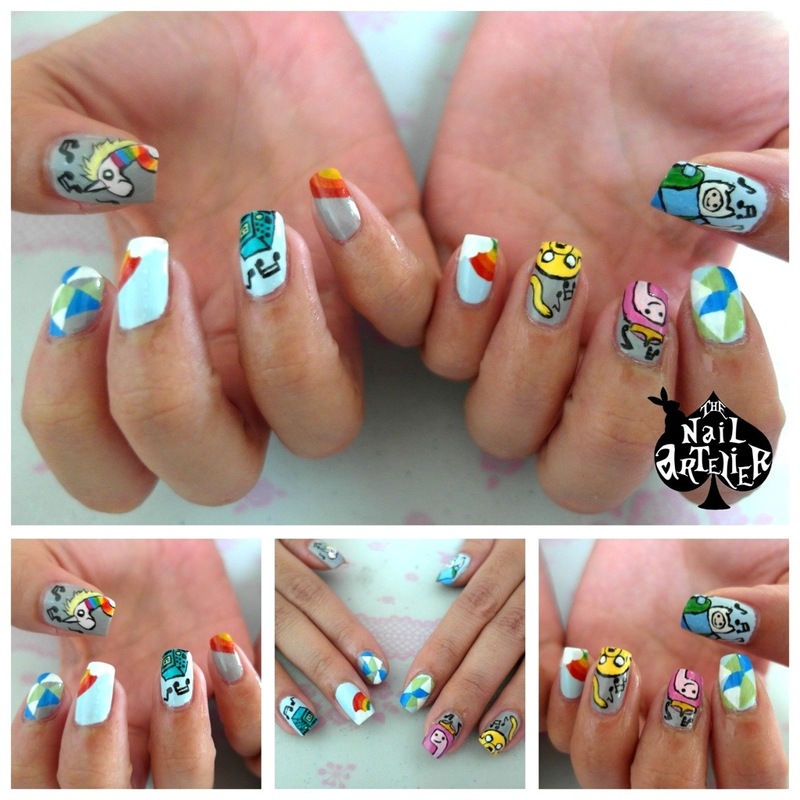 Nail Art: It’s Adventure Time! Vanessa had been wanting a set of Adventure Time themed nails, and finally got them! 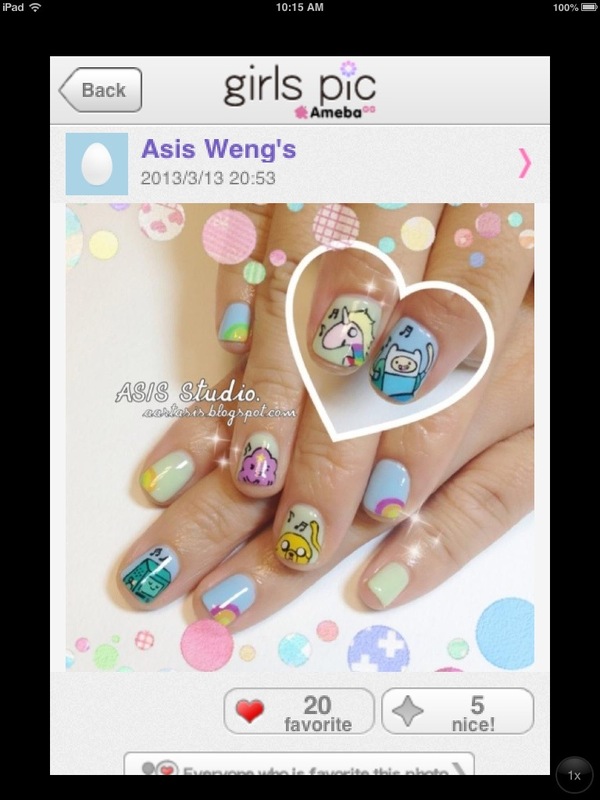 This set was inspired from Asis Weng, a talented nail artist based in Taiwan. The characters from Adventure Time are dancing along to music, and its a very cute and colorful set. Not all the nails consist of a character as it will make the whole set very complicated; I did simple rainbow art and geometric design. 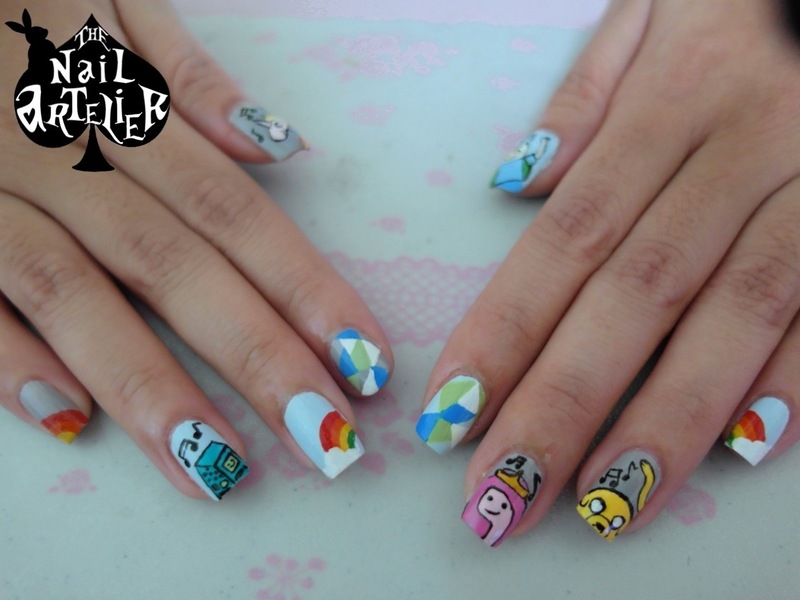 On her right hand, we have the Korean-speaking Lady Rainicorn (girlfriend of Jake the Dog) on the thumb, and a dancing BMO (a living video game console of Jake and Finn lol). 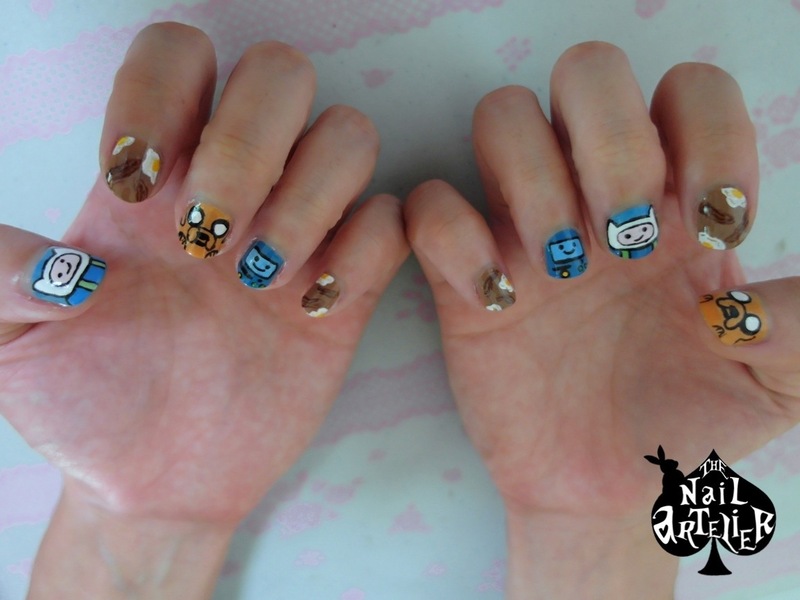 And on the left hand, we have Finn on the thumb, and Princess Bubblegum and dancing Jake on the fingers. I really love the set, super cute!